Don't shop for a used car hoping to hammer them down from the asking price, negotiating on the fly and not knowing the true value of the car. When you finish reading this section, you'll have all the tools to give you the upper hand in negotiations. There are two types of purchase to consider which will be discussed in detail because there are differences between negotiating with a dealership vs. a private seller. When you call to find out about a car, ask for all the options, mileage, etc., then look up the prices before you go. Expect sellers to advertise grossly inflated "Hail Mary" asking prices to "allow for negotiation." This is why you must do your research ahead of time. Ask questions when noises pop up. Listen for noises, rattles or grinding sounds. If you hear rattling in the quarter panels, the car may have been in a wreck. See if the car shifts smoothly. Check the heater and the A/C. Listen for grinding noises when the A/C kicks in which can mean the bearings in the compressor are worn. If the car has a voltage display on the dashboard make sure it reads roughly 13.6 volts when the A/C is on. Drive with the radio on and off. Test the speakers to see if they are cracked. Make sure the CD player works. Take the car on a highway, main streets, and side streets, see if the car loses alignment, or bears to the left or right. See how the brakes are. Make sure all the seat belts work, that power seats work. Look for missing or burned out bulbs inside and out. If the car has retractable headlights, make sure they pop up and turn on. Make sure the brake lights, reverse lights and directional lights work. Ask the seller when the brake pads were last replaced. Check under the hood to see how clean the engine is. Check the transmission fluid and make sure it's not black. Check the air pressure in the tires and check for uneven wear on the tread. Ask the seller when the tires were replaced last. Tip: Check for Leaks in the Car! Spend $4.00 to $8.00 and get a automatic high pressure car wash before buying the car. After one of our visitors bought their car they did just that and discovered that the new windshield leaked. It is extremely important to know about the car's past. At this point, you should already have a Vehicle History Report for the car. If you don't, visit AutoCheck and get it now! Click here to read our full Vehicle History Report article to find out why. Another benefit is that the information in the report can help negotiate a better price. Look for water lines on the engine, radiator, wheel wells, inside the car. Examine the underside on a lift. New carpeting or upholstery. No one re-carpets their car for no reason. Lift a corner of the carpet and look for a mess underneath. They don't always do a good job cleaning. Look for mold or a damp musty smell. Check for rust by the door hinges and look in the trunk under the mats. Check the spare tire and crow bar, make sure they are not rusted. Use a mirror to check under the seat. If the metal has been contact with moisture, the metal rusts quickly. Check the air intake filter. Some people are such losers that they don't even bother to replace the soaked air filter, so you'll see debris like grass, twigs, and papers on the filter or inside the air intake opening. Run the title search on the car using AutoCheck. Forget about the asking price, offer what the car is worth based on market values.Don't forget to subtract for high mileage and add for options. Many pricing sites have three categories of condition of the car which they report the market value of. The condition will be listed as bad, fair, good and each has a different price range. A good way to determine market value is to go to eBay and view the completed auctions for similar vehicles. You will be able to see what the actual selling price was. You should also go to used car listing sites and find ads that are lower priced than the car you are negotiating, to prove he is asking more than others. Manual transmission vehicles have lower market values than automatic. The main benefit of these sites is there are many more cars to choose from than your local newspaper. Try them all, they're free to use. CarClearanceDeals.com searches the huge inventory of vehicles from their network of dealers to get you the best discounted price. Use their simple form to select the make and model and instantly see what is available near you. You will be able to easily get quotes on several similar cars to give you negotiating power! Looking for a used car? TrueCar has you covered. With an extensive inventory of over 750,000 pre-owned vehicles for sale at Certified Dealers nationwide. You can browse through quality vehicles and know the condition of the car before you buy. Sort vehicles by TrueCar Price Rating, favorite colors, body styles and more. Plus, you can get used car discounts* and free CARFAX Vehicle History Reports on qualifying vehicles. (*Used car discounts not available in all states). Cars.com is the place to search for your next car, truck or SUV with over 2.8 million used car listings. Compare used vehicles, locate certified pre-owned cars, quotes from used car dealers and private sellers. You can also sell your car fast at Cars.com. Place your online ad to reach millions of car buyers. Things like high mileage, bad tires, cracked dash, faded paint, rust, seat stains, missing mats and torn ceiling will greatly reduce the value of the car. You must use that to your advantage in negotiating used car prices down. Everything above applies to both types of deal. There are some key differences that you need to be aware of depending on who you are buying from. If you are looking at cars at dealers and private sellers then everything will apply to your situation. The word "certified" is overused marketing for "reconditioning" tasks that some car dealers do to a trade in before they resell it. Some dealers lie and don't do a thing, some spray black paint on engine wires to make them look newer. For others it's a hot air excuse charge you more money. In fact, several of our visitors have reported running vehicle history reports on "certified"; cars and found they had been in prior accidents. Don't let the word "certified" make you complacent and fail to perform due diligence. Watch out because many 90 day warranties offered with certified cars only cover the power train and nothing else. Most people aren't aware that there are discounts available on used cars. TrueCar has deals with many dealers to give special discounts if you make contact through their site. Vehicles with discounts are highlighted in the search results. Due to legal issues, the discount is disclosed after you make contact with the dealer. You will pay less than somebody buying the exact same car without having visited TrueCar. You can also take advantage of some of the other features that they have available. Using their exclusive data, they will rate the price of each vehicle. You will go into the negotiation knowing if the dealer is trying to charge too much or if they are being fair. Depending on where the price falls, you will know how tough you need to negotiate. This sticker tells you if the car is sold "As Is" or has a warranty and what obligations the dealer has. If the salesperson says the car has a warranty but the Buyers Guide sticker says "As Is," the sticker overrides the salesperson. Unless there is time left on the original manufacturer's coverage, you have no protection if "As Is" is checked. Our number one complaint from consumers buying a used car from dealerships is that the salesperson lied and told them the dealer will repair any failures. Of course they then refused the repairs. If the deal was conducted in Spanish, you are entitled to a Spanish language version of the Buyer's Guide. If the Buyers Guide stickers aren't on the windows, leave immediately! When negotiating, remind them that they paid $3,000-$4,000 less than market value for the car so they can afford to charge less than market value. True market value is not just a price in a book, it's whatever the market will bear. If they try to justify their price by bringing up the warranty, tell them you should not have to pay extra for the car to be reliable for 90 days. It does not matter how much they "claimed" they paid for the car or how long it's been sitting there, the car is worth only what it's worth, what you are willing to spend, not what they write on the sticker. If you tell the dealer you have Kelley Blue Book pricing, they will say they use NADA pricing which is higher because it includes dealer cost to recondition the cars. By the time you are negotiating the price, you should have already verified the vehicle's past with an AutoCheck report. If you haven't, don't go any further with the deal until you do. Click here to read our full Vehicle History Report article to find out why. Additionally, you can use the information contained in the report to negotiate a better price. Read Using a Auto History Report to Haggle a Better Deal. My friend Jerry showed up with a bank draft for $400 less than the $26,999 quoted. The dealer accepted, as he was not about to let it slip away. His mom bought a used Mercedes CLK320. The dealer said $49,600 was their "rock bottom price." She showed up with $48,500 and the dealer took it. Why are you selling the car? Why do most people sell their car? Maybe they lost their job, or there's too many things wrong with it and they don't want to fix it, they'd rather sell it to you. Maybe they bought a better new car and are selling it themselves. How many miles are on it? This can really reduce the selling price if there's too much mileage. The standard is 12,000 miles per year. If they have more than that, the value will drop. Have them describe the condition of the interior, the seats, the paint, tires and ask if the A/C runs cold. Are there any other known issues or needed repairs that you should know about? Click Here for our checklist of questions to ask the seller. Make an appointment to see it during the day. At night you can't see all that's wrong with it. Show up a few minutes late to make the seller a little stressed. Always show up with at least one other person. It's harder for a seller to say no and challenge 2 or more people so always show up with an aggressive companion. Make sure you have your license with you or the seller won't allow you to drive their car. Have your partner be negative, pointing out every little problem. A great tactic with huge psychological impact is to rub your finger over every scratch or dimple and shake your head no in disappointment. You don't have to say a word, the seller reads it right off your face and you've set him up for the low ball offer. Ask if the car has been in a wreck, staring them right in the eyes waiting for their answer. If the answer is yes, inspect the area that was repaired, and point out every tiny little flaw in that repair. If the answer is no check the tires and windows carefully for evidence of paint over spray. Sellers put a cheap paint job on the car and lie about it being in a wreck. If you visit a seller to test drive the car and they don't let you drive it, leave immediately. I cannot believe how many used car buyers pay a deposit or write a check for the entire amount without even driving it, or worse, without any receipt! Check the driveway or garage floor for signs of fluid leaks. Rust colored stains indicate a leaking radiator. Black or brown puddles and stains indicate an oil or transmission fluid leak, and purple puddles indicate transmission fluid leaks. The seller will lie about his car not having leaks, but a driveway never lies. Ask the seller to point out all known issues with the car. The check engine light should not be on. If it is, it can indicate a wide range of problems which can cost anywhere from a few dollars to several hundred dollars to repair. 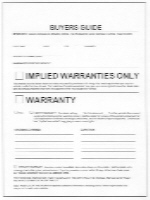 Ask if there is an extended warranty with the vehicle and if it is transferable to you. Verify this. Ask to bring the car to your mechanic to check it out. If they say no, you have to wonder what they are hiding. Most private sellers don't know how to price a car, so when you give your offer, it may be far less than the seller's "Hail Mary" price. They'll get all insulted, and tell you you're crazy, that's way below their asking price. That's when you show him the printouts from all the sites I recommended or send them the links. Tell the seller if the car was really worth the asking price then it would have sold already. Now is the time for your buddy to chime in and head for the car, motioning to leave. Your buddy says "he's not going to lower the price, you are just wasting your time, and you should go back to the other seller who was "flexible." Your buddy reminds you the "other car" had lower mileage. You must always be prepared to walk. There will be other cars. Tell the seller here is no way you will pay more for any car than fair market value. Right after you say this turn to your buddy and ask him where the next stop on your list it. Your buddy should pull out other ads and read an address. Head to your car to leave. Hopefully this will make the seller hop into action and accept your offer. To get a good deal our strategy is to keep the seller on the defense. Whoever asks the questions is in control of the conversation. Continue firing difficult questions at the seller, but be polite. Don't say "You're crazy" or other rude things. Use facts like "the research I have here shows that your car is only worth this." How can the seller argue with facts from sites who are experts at pricing cars or from actual closed eBay auctions? If you're the type that feels uncomfortable with face-to-face negotiation you may want to negotiate via email. Just make sure if you do this that you save your emails as a record of the agreement.